I’m fascinated by the concept of population centers. In the United States the U.S. Census bureau defines the Mean Center of Population as: the point at which an imaginary, flat, weightless, and rigid map of the United States would balance perfectly if weights of identical value were placed on it so that each weight represented the location of one person on the date of the census. Over time that point will change. The U.S. calculation shows a steady westward march with a distinct bend towards the southwest in the last half-century. I’m not going to focus much more attention on the U.S. mean center of population. I think it’s already pretty well understood. If you’d like to explore this set of issues in further depth you can watch the Census Bureau map animation and head over to their dedicated site. It includes everything you’d possibly want to know including how they calculate it. Instead, I’ll take things down a layer and examine some individual state centers of population. The U.S. Census Bureau calculates state centers every decade so it’s easy enough to drop the lat/long coordinates into a simple Google Map. I did this for the 2010 calculations (blue push pins), and just for fun I did the same thing for the 2000 calculations (red push pins). I’ve embedded the resulting tiny map above for illustrative purposes. You’ll probably want to open this in another tab if you’d like to explore it further. You’ll find two pins per state if you drill down far enough. I haven’t forgotten about readers in Alaska and Hawaii either. Zoom out and you’ll find those too. The differences in location between the red and blue pins signifies a movement of the mean center of population for each state over the prior decade. Bear in mind that these represent two points in time. They might suggest a basic direction and a possible magnitude but don’t consider them too precisely. Obviously I could improve this by adding a few more decades like the U.S. map but I didn’t have enough time to enter several hundred more data points this morning. It might be worth trying that for a few select locations in a future article if anyone is interested. I’ll have to think about that (not sure where I’d get all the data at the moment). My mind naturally wanders towards anomalies. A large metropolitan area in an otherwise sparsely-settled state will pull the center of population closer towards its orbit. The effect is particularly noticeable for dominant cities located near state boundaries. Some of these are intuitive. Las Vegas dominates Nevada from the extreme south, even with a couple of smaller cities like Reno and Carson City to the west trying to offset it. The population center still gravitates towards Las Vegas. Similarly, the Salt Lake Valley pulls Utah’s population center towards the north-central end of the state, to the outskirts of Salt Lake City itself. Oregon surprised me a bit. I realized that southeastern Oregon was vast and empty so I fully expected the center to land closer the Pacific coast. I didn’t realize how far Portland would pull it north, though. Nebraska and Kansas confirmed my suspicions. Omaha and Lincoln dominate Nebraska. The football stadium at the University of Nebraska-Lincoln is sometimes called the state’s "third largest city" on game day; a clear demonstration of that skew. The Kansas City metropolitan performs a similar function in Kansas. Many of the Great Plains states follow this pattern. They are transitional areas in a sense. They straddle eastern and western parts of the U.S., with people concentrated towards the east and open grasslands towards the west. The population continues to move towards the cities which are found in the east. New York clearly shows the greatest imbalance for Atlantic coastal states. New York City and Long Island pull the mean center of population appreciably towards the southeast. Again, let’s bear in mind that I’m using only two points of data. Nonetheless, one can observe fairly meaningful movement in West Virginia and Virginia. Both are feeling the gravitational tug of the Washington, DC metropolitan area. Northern Virginia experienced tremendous growth over the decade. The same was true for the three eastern panhandle counties of West Virginia (Morgan, Berkeley, and Jefferson) which grew at about 25% between 2000 and 2010. Alaska provides another interesting case study. The mean center of population moved quite a bit albeit it’s a large state that shows greater movement in terms of pure mileage anyway. Anchorage tugged the center towards its borders as one would expect. There’s also a significant northward component I hadn’t anticipated that demonstrates the growing pull of the Mat-Su Valley. The Matanuska-Susitna Borough north of Anchorage is a rapidly expanding exurb of the city. It jumped from 60,000 people in 2000 to 90,000 people in 2010 — a phenomenal 50% growth. That might not seem like a lot of people in terms of raw numbers but it creates a meaningful impact to a low-population state like Alaska. By contrast, the northeast United States displays very stable centers of population. Connecticut’s center, as an example moved maybe 1,500 feet over the decade. People visit confluences, highpoints and directional extremes, so why not centers of population? Best of all they change every decade, refreshing the list and providing plenty of opportunities to return to each of the 50 states. Some of these are tough spots in remote areas or even out to sea as in the case of Hawaii. I think one of the tougher locations, if not the toughest, might be Nevada. The population center lands squarely on the Nevada Test Range. The military might not look too kindly upon interlopers unless one wants to see the center of population at Guantanamo Bay. There are plenty of easy occurrences near roads in well-developed neighborhoods. I’d argue that Minnesota is easiest of all: the spot appears to fall directly upon Interstate 94 northwest of Minneapolis. It’s not just near I-94 or adjacent to I-94, but right on the very road surface of the westbound lanes. Thousands of people visit Minnesota’s exact mean center of population every day. I wonder if anyone every realizes it? I’m going to crown Nevada as the grand champion of state population centers. It’s skewed heavily away from the geographic center (towards Las Vegas), it’s moving rapidly (again, fueled by Las Vegas) but it’s remote and inaccessible (middle of the desert on a military facility). I couldn’t feature every peculiarity. Doubtless there are other interesting stories waiting to be uncovered between the push pins if you choose to hunt for them. I once was told by a geographer at Louisiana State U. that the population center for the state was, before the 1940s or 50s, located in Mississippi, reflecting the higher pop density on the eastern side of the state. With the development of oil and gas fields both on- and offshore, the population of cities like Lake Charles and Port Sulpher along the southwestern border exploded and subsequently dragged the pop center back into Louisiana proper. Totally anecdotal, but as noted it came from something of an authority, so I believe it. It’s pretty close to the southwestern corner of Mississippi even now so it does have an air of plausibility. What I found interesting, if you drill down on Louisiana, is that one can see how the population center shifted a couple of miles towards the northwest away from New Orleans. My guess is that this reflects the out-migration as a result of Hurricane Katrina. New Orleans had 140,000 fewer residents in 2010 than 2000 (a 29% drop). Just checked the official points for Louisiana from the site you linked – and none of them actually lie in Mississippi (as can be easily checked by the fact that none are north of the 31st parallel). The point for 1930 comes the closest, though – it’s something like ten miles from the corner (and only five from the border). It’s also supposed to be uncertain by, quote, “up to one mile” (which is still not enough to put it within Mississippi, though). Could anyone find any other examples (other than the obvious “example” of Hawaii, where all the surrounding water doesn’t quite surround anything but Hawaii, so I just count it as part of Hawaii anyway), or (likely to be hard – if correct, which I doubt) prove that there are no others? Surprised how stable Massachusetts and New Hampshire’s moves were, I tried calculating the shortest move. Of course, this appears to be Washington, DC itself, but it’s only trivially shorter than Massachusetts’ move. The problem with my initial calculations was that I didn’t compensate for the curvature of the Earth – i.e., I was just using the square root of the sum of the squared differences in latitude and longitude. Upon recalculation using the great circle distances, Nevada does in fact wind up on top at about 10.5 miles versus Alaska at 9.3 miles which looked longer using the other method. Along those lines, I’d also recommend normalizing the distances based on the square root of the area of the state. A longer distance is less impressive in a large state, in my opinion. Thus, in my opinion, Oklahoma is a real surprise. The movement of its center rivals the New England states at about an eighth of a mile, but since it’s a much larger state, the movement is insanely small. On the other hand, the largest normalized change is in Delaware whose (unnormalized) move of about 2 2/3 miles mostly southward is large in such a small state. The state grew 14.6% in population over the last decade – itself an astounding amount – but as northern New Castle County is largely saturated with suburban developments, it couldn’t absorb the growth without higher density infill, so the growth has been more southward. Columbia makes a good capital for South Carolina, being very close to the center of population. Phoenix and Denver also do well in this respect. Providence too, though given Rhode Island’s size this is not too surprising. Idaho, Maine and Wisconsin all have centers further north than I would have expected. I looked at your center of population for Washington. It turns out to be located in the Cedar River Watershed–a tract of restricted access land owned by the city of Seattle and used as a municipal water supply. While access isn’t as strictly monitored as the Nevada Test Range, no doubt, it’s still probably one of the trickier points to get close to, among the various state center of population points. Connecticut’s 2010 center may suffer from a similar lack of access. While it’s just a couple of hundred feet off a suburban street, I suspect (it’s hard to be sure) that the spot is within the watershed of the City of Meriden’s Broad Brook Reservoir and therefore would be off-limits to most access. Off-topic odd map: have people seen this supposed postcard that has been around the internet a bunch of late? 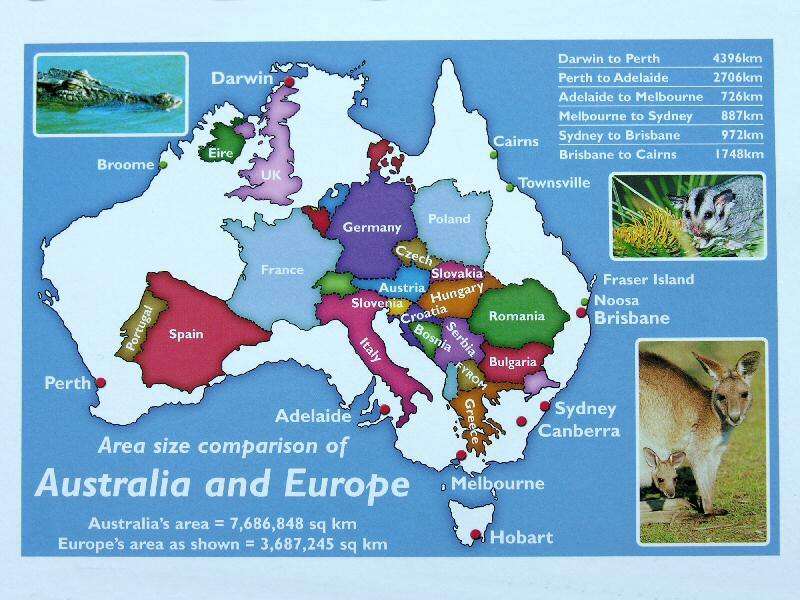 It shows a comparison of much of Europe and Australia. But the Europe map doesn’t look quite right. I think I’ve narrowed down the time: 1945-1947, when Germany wasn’t definitively divided, Hungary’s WWII claim to Carpathian Rus may not have been settled, as with the border between Czechoslovakia and Austria, which look something like that of WWII, and Moldova wasn’t definitively separated from Romania yet. To make things even stranger, I also found this pic, which seems to be a more standard post-WWII map, but with an undivided Germany. They seem to be the same designer, though. To make things even a bit more strange, the internet tells me that that Australia didn’t adopt the metric system until the 1960s, so this isn’t just ahead-of-its-time design. Any thoughts of provenance? A contemporary person who has the wrong map? It has to be right? But then they changed it, but not much? Strange. It looks like the last time Hawai’i’s population center was on land was in 1980. It seems to be moving towards Moloka’i right now, but I’m curious if we will get to see it reach land someday. Is there any source for county population centers?